GEORGE TOWN, Malaysia — Activist Nisha Ayub has demanded that the Pakatan Harapan (PH) government state its stand on the lesbian, gay, bisexual and transgender (LGBT) community after her portrait with a Malaysian flag draped on her was removed from the Stripes and Strokesexhibition here. She said she expected it to happen but when news of the removal was published in Malay Mailtoday, it made her emotional thinking about the future of the “new Malaysia”. “I was not at all angry nor worried when they removed the pictures but it’s the message that is being spread to the public and to all marginalised community in Malaysia that saddens me,” she said in a Facebook post. “As a citizen of Malaysia, I want to know the stand of our New Malaysia towards minorities like us,” she demanded. She said the new government talked about the rights of Malaysian citizens and yet they are denying people like her “to even express her love” for the country. “What is happening to our New Malaysia? Is that what we, the marginalised community, voted for? They talk about sensitivity of certain groups of people but what about sensitivity of others?” she asked. She stressed that she did not ask for her picture to be portrayed in the exhibition but she was glad to be part of the exhibition to show that she was proud to be a Malaysian. “But now I feel as if I’m not welcome anymore to be in the country where I’m born,” she added. 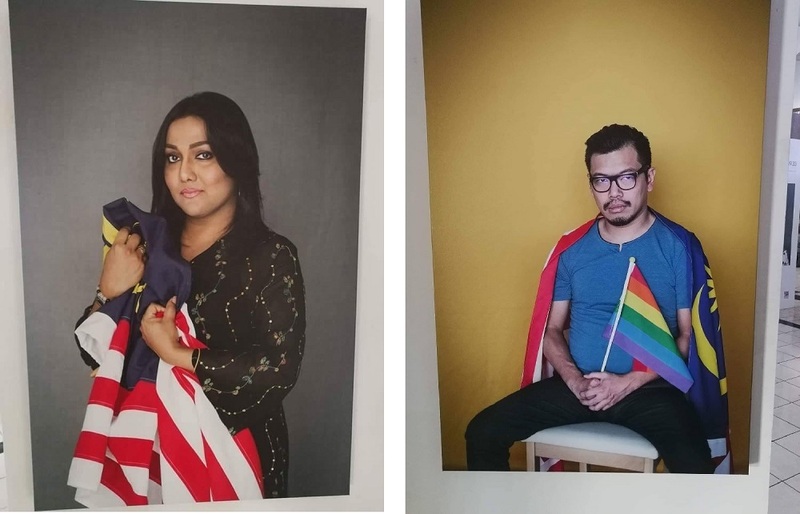 Nisha and another LGBT activist Pang Khee Teik’s portraits posing with the Malaysian flag were taken down from the photography exhibition by photographer Mooreyameen Mohamad that was held in conjunction with the annual George Town Festival (GTF) 2018. The exhibition sponsor, Datuk Vinod Sekhar, expressed his shock that this could happen in Penang, especially now in the “New Malaysia” under PH. He said Nisha and Pang were inspirational people of courage who should be applauded. Nisha also said she had a few opportunities to leave the country but she did not do so because she wanted to speak up for the LGBT community. “My dear New Malaysia, I may be a transgender, a ghost, a devil, pondan, bapuk, deviant or whatever names you want to call me … but I’m still just a Malaysian that has family, friends that has always HOPE for a better more inclusive Malaysia,” she said. She said Malaysia is not only about one particular group nor race but it is about everyone. “Check my records and you will see the only crime I did where I was put in jail was because I expressed my gender identity as a transwoman back then,” she said. She asked if it was a crime for her to show her patriotism to the country. “As a Malaysian, I want to know where people like me fit in in this New Malaysia that most of us voted for,” she said.